A simple shooting drill that focuses on unopposed striking of the ball working in pairs. Players perform 5 passes between each other before one of them takes a positive first touch in front to strike at goal aiming to hit the target as a minimum outcome. This shooting drill involves finishing under pressure from a defender. 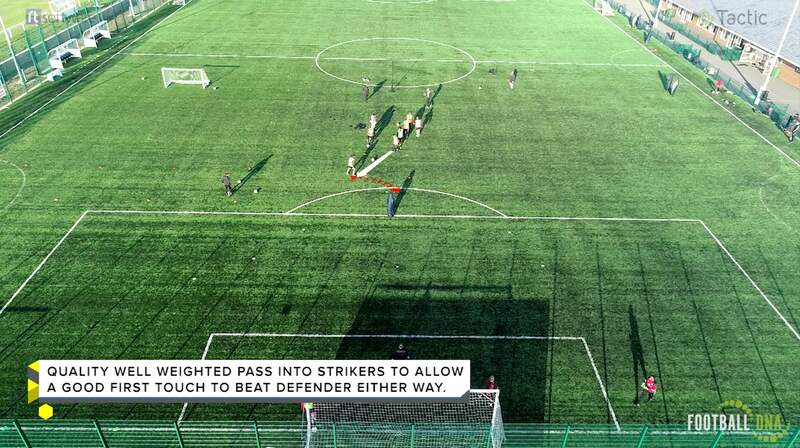 The attack starts with 2/3 attacking players collecting 1/5 footballs and driving forward against a defender who starts on the post. The 2 attacking players work together to create a goalscoring opportunity. If the defenders regain the ball, the attack is finished. Two groups play at the same time competing to see who scores the most goals. Attacking players rotate as do the defenders. This shooting setup introduces players to movement before receiving & producing combination play before finishing after a 1 v 1 situation. The attacker starts by creating space with a check away movement to the cone and back before playing a wall pass and then creating an angle to receive. After receiving, the attacker takes a good first touch into the space, beats the mannequin and strikes at goal.